How to Help Your Hurting Friend, through pain. Through illness. Through depression. Through loss. This is a carefully written book. The words are pointed and chosen, with attention and care. Susie Shellenberger has many years of experience working with hurting teens, and she does not take these issues lightly. She doesn't have all the answers, and she stresses that, multiple times throughout, reminding the reader that they are not a counselor. They can only do what they can do as a friend. They can listen and lean and encourage and support, but that does not expel the need for professional help, and prayer, and more guidance. For more information on How to Help Your Hurting Friend by Susie Shellenberger, visit our website here. Suspense, intrigue, espionage - maybe less of the latter and more of the former. 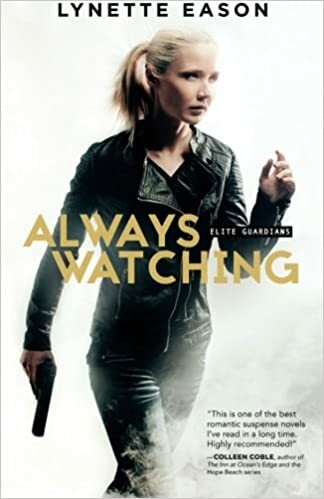 I'm still trying to decide if the title of Always Watching is meant to be creepy or comforting, though I suppose it's suitable for both, taking into consideration the plot of a murderous stalker pitted against a hired bodyguard agency. Both sides of the fight are always on the lookout. Eason trails Wade Savage, a rich and famous radio show-host and psychiatrist, who seems to have acquired a rather eccentric and dangerous fan: a stalker that leaves gifts too specific to be guesses. Whoever it is knows things about him and his daughter that they couldn't know without watching them closely. Against Wade's wishes, his father hires a bodyguard agency to keep an eye on him, and they go unnoticed until one night when Wade is attacked at his radio station and his bodyguard is nearly killed. They tighten security. They assign a larger, closer detail to accompany both Wade and his daughter, at all times, especially after his daughter Amy is targeted more directly. Bomb squads, raging fires, gun shots, knife fights - what more can you ask for in a suspense novel? Besides a side dish of romance, which there is, naturally. And the relationships that develop between Wade, his daughter Amy, and their bodyguards are quite fun to follow. For more information on Always Watching by Lynette Eason, visit our website here. "Featuring the hit "Good Good Father", this live CD (Recorded in Atlanta Georgia) highlights the creativity and musical sphere of a great live worship/pop band. As a worship team at church, all songs get filtered through the church body and with Marks efforts in song writing, amazing stuff happens. Solid lyrics and a feeling like you are there at the concert make this a great musical choice." For more information about the CD "Live Worship Experience" by Casting Crowns, visit our website here. This book was longer than I expected. One of those stories where, halfway through you check to see how far you are, thinking they must resolve something soon, only to see that you have most of the book left to go yet. How can Patrick Carr possibly keep up the suspense and intrigue for the rest of the book? In a court fraught with jealous nobles and deathly politics, Willet Dura is the least of them. Raised to his position by the king himself, he has the title of Lord but no land or wealth to go with it. Only his reputation of death does him any credit - and that credit often does more harm than good. As the king's reeve, he seeks to investigate murders in the city and bring the guilty to justice. He is observant, and fierce, and his prowess in his task brings him to the king's attention. But that same prowess pits him against the nobles that scorn him. "He brings death with him everywhere he goes"; and upon acquiring a rare and strange gift, that accusation is only brought against him more often. Carr manages a twisting, turning plot and a cast of fascinating characters with notable development. Willet, perhaps the most changed of them all, is assigned a capable and infallible guard whose loyalties lie first with the Vigil - the secret sect that Willet stumbles into because of his strange gift. I found this guard, Bolt's, character one of the most interesting to follow. Very little trust is placed in him or found in the Vigil, and with his newfound gift and several more murders to contend with, Willet must navigate secrecy and danger at great cost to himself. Very mysterious, very dark, and very twisted at every chapter break. I had a hard time putting this one down. But it's not the end - this is only book one in the Darkwater Saga. For more information on The Shock of Night by Patrick Carr, visit our website here.